After it was announced that All the Money in the World director Ridley Scott had recast Kevin Spacey's role with Christopher Plummer, it was reported that all of the actors came back to do the reshoots for free. But a new report suggests that not only was that not the case, but that Michelle Williams made less than 1 percent of what Mark Wahlberg made for the reshoots that took 10 days to complete and took the actors away from their families for the Thanksgiving holiday. The news comes at the height of the Time's Up movement, which was set up after the Harvey Weinstein scandal and to compliment the Me Too movement. 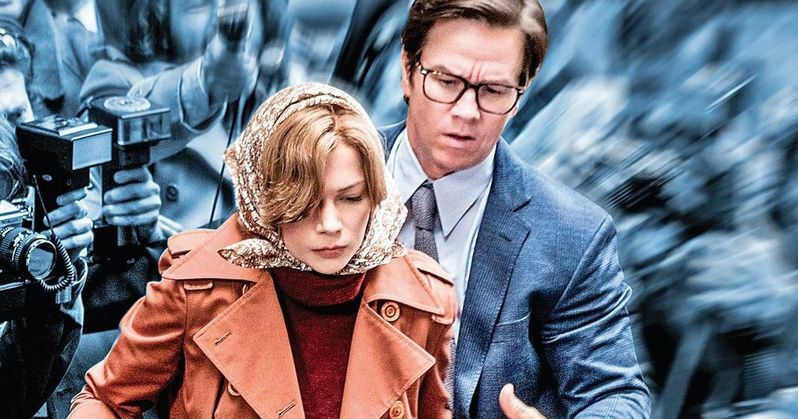 USA Today reports that Michelle Williams was paid less than $1,000 dollars for the 10 days of reshoots on All the Money in the World. More accurately, the report states that she was paid $80 a day, which brings her grand total to $800 for the entirety of the reshoots. Mark Wahlberg on the other hand, was paid $150,000 per day for a grand total of $1.5 million dollars, which means that Michelle Williams made less than 1 percent of what her male counterpart made. Ridley Scott claimed in a recent interview that he did the reshoots for All the Money in the World for free as did the rest of the cast. Scott claimed that the reshoots were not very expensive because everybody made the decision to work for free, but that has been proven to be untrue. Mark Wahlberg's team negotiated the hefty fee for the reshoots, which was then reportedly kept from Michelle Williams. Both actors are represented by the William Morris Endeavor Agency, who has yet to make a statement. Instead of official statements, the Hollywood community has come out in outrage over the report that Williams made less than 1 percent of what Wahlberg made. Director and writer Judd Apatow took to Twitter to voice his concern with the wage gap as did a whole bunch of other celebrities who are standing up for Michelle Williams. Apatow tweeted that he was in disbelief when he first heard the news. He explains. "This is so messed up that it is almost hard to believe. Almost. This is how this business works. I wonder if the studio or Wahlberg will do something to make the situation less insane." Jesse Tyler Ferguson stood up for Williams and said, "Michelle Williams is one of the best actress working right now. It makes me furious that her talent is undervalued in this way." Actress Busy Phillips also took to Twitter to say that the whole deal was "Unacceptable" and "Shameful." Jessica Chastain also spoke up about the wage gap. She had this to say. "I heard for the reshoot she got $80 a day compared to his millions. Would anyone like to clarify? I really hope that with everything coming to light, she was paid fairly. She's a brilliant actress and is wonderful in the film." There has been no official statement released by anyone from the All the Money in the World crew on the matter as of this writing. All the Money in the World was nominated for three Golden Globes (Best Supporting Actor for Christopher Plummer, Best Director for Ridley Scott and Best Performance by an Actress for Michelle Williams) but didn't take home any awards from the ceremony. This is a developing story and more news is expected to be announced soon. Until then, read Hollywood's reaction to Michelle Williams making less than 1 percent of what Mark Wahlberg made on the All the Money in the World reshoots below, courtesy of Jessica Chastain's Twitter account. Agencies have to stop being complicit in the underpayment of their clients. REMINDER THAT MICHELLE WILLIAMS WAS NOMINATED FOR A GOLDEN GLOBE FOR HER PERFORMANCE IN ALL THE MONEY IN THE WORLD AND MARKY MARK WAS NOT AND YET HE GOT ALL THE MONEY IN THE WORLD TO BE THERE.